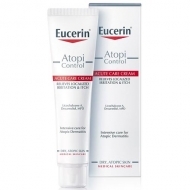 Hydrates, regenerates and protects;Calms itching and irritation;Strengthens the skin's natural barrier. 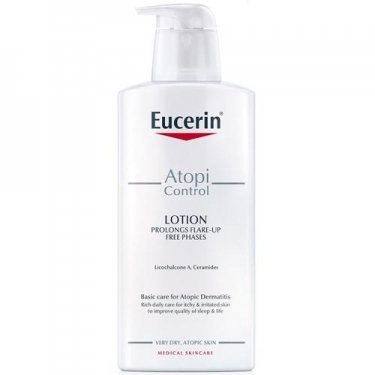 Atopicontrol Body Care Lotion from Eucerin is a water-in-oil, easily absorbed lotion that moisturizes and reduces the roughness of atopic skin. 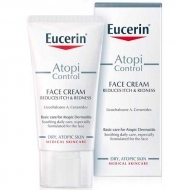 It uses a combination of Omega-6 fatty acids (Primrose Oil and Grape Seed Oil) and the soothing Licochalcone A (an extract from licorice root) to restore skin, helping to restore its natural barrier and make it more resistant. 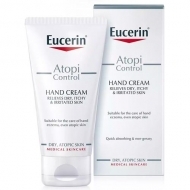 With regular application, the itching and tension are relieved, the skin becomes soft and noticeably soft. The water-in-oil formula contains no perfume and parabens to minimize the risk of skin irritation and allergies.